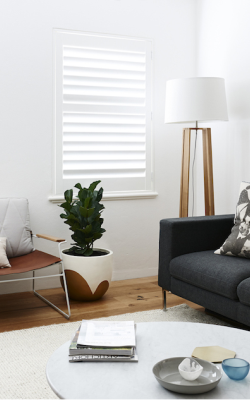 Blinds on the Net can now supply quality Australian Made 89mm PVC Shutters with a 10 year Warranty. Solid PVC with an aluminium core for stability our Shutters carry a 10 year warranty. They are low maintenance and allergy free and allow excellent control of light, privacy and airflow. PVC Shutters are a great insulator assisting with the reduction of energy costs. Blinds on the Net PVC Shutters are excellent for high moisture areas such as bathrooms and kitchens as they are easily cleaned and maintained. With the same accurate measurements you would take for blinds you can now order quality interior PVC shutters (supply only) and save! Measurements are entered the same way as Recess or Face mount. You will also require the same basic DIY skills you use to install blinds. Click the picture below to see how easy the process is. You can just get a price, order a free sample or place your order. We have kept this simple and only offer an 89mm elliptical blade with a hinged format in a choice of 3 neutral white/off white colours. Maximum panel width of 900mm. Windows up to 3600mm wide. Framing options include L- frame for Face Mount or Recess Mount in a perfectly square Recess. Blinds on the Net recommends Z-frame for Recess Mount. U channels are available for fixed panels. Scroll down below for a summary of specifications or (click here) for the product manual. Contact us to have specific Shutter measuring instructions emailed to you. (Contact us). Recess Mount; Factory will deduct 3mm width and 4mm height. Face Mount; No deductons will be taken. Tilt Rod Type Only hidden tilt rod option available. Will be fitted to the rear of the panel on the hinge side unless specified otherwise. Shutter panels can have split tilt mechanisms split into 2 or 3 sections without need for a midrail. Measurements from the bottom of the panels are required. Tilt rods will automatically be split at approximately 1000mm. Louvres Only 89mm elliptical shape available. These are available in the solid PVC with an Aluminium Core. All products supplied are of a customised nature. For this reason we cannot accept returns, issue refunds, or recognise change of mind for any reason outside those specific circumstances disclosed in our warranty policy, once production has started. We reserve the right to waive or alter their policies and to decide the terms of adherence required on a case by case basis. Please carefully inspect all cartons & packages upon arrival and report any damages immediately. Photographic evidence must be supplied at the time of re-order for any items received damaged or defective goods (these must clearly show any issues). If defects are evident on multiple panels then a minimum of one photo per panel must be supplied. All re-orders must be supplied in writing. We will not be responsible for any goods returned & damaged due to poor packaging. We offer a 10 year warranty from the date of purchase.